It's hard to believe it's almost been a month since Halloween, but if you recall, we carved a couple pumpkins this year. 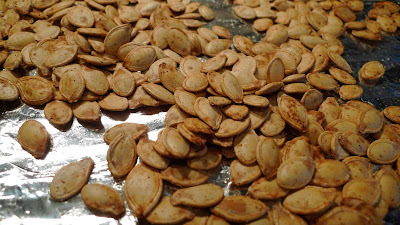 I've always wanted to try roasting pumpkin seeds so I made the kiddies save the pumpkin seeds so soomeenshee emo could use them later. I found similar recipes online. I happen to have Lawry's seasoned salt on hand so I used that, but you can use any seasoning that you like. Once you've separated the seeds from the stringy core, rinse them with water. In a small saucepan, add the seeds to water, about 2 cups of water to every half cup of seeds. Add a half tablespoon of salt for every cup of water (more if you like your seeds saltier). Bring to a boil. Let simmer for 10 minutes. Remove from heat and drain. Toss seeds in a bowl with the melted butter and salt. 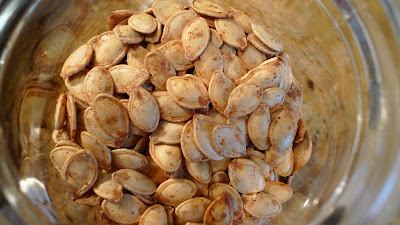 Spread the seeds in a single layer on a baking sheet and bake for about 30 minutes or until golden brown. Remove from the oven and let the pan cool on a rack. Let the seeds cool all the way down before eating. Either crack to remove the inner seed or eat whole. I put them in a jar and left them by the tv for some late night munching. 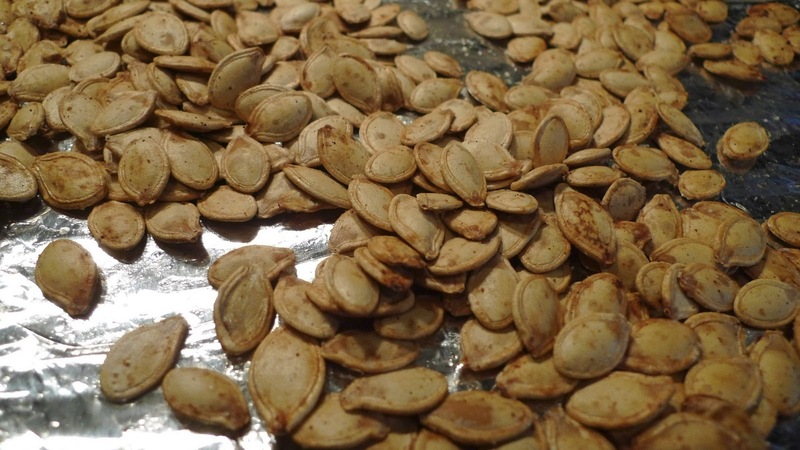 I also used this as a topping for some chili I made recently so there's a variety of uses for these healthy, guiltless roasted pumpkin seeds.